I did not have my regular set of ingredients this time around and I knew my fiancé was patiently awaiting pancakes since I had been away on vacation the past two weekends. I kept telling him I could not make panackes because I didn’t have the usual ingredients. He repeatedly encouraged me to just make them with whatever I had because he would eat them anyway. So I listened and to my surprise, this is the best version yet. Preheat non-stick pan on medium heat. Combine dry ingredients and mix them. Add milk, water and syrup and mix just until lumps are out and mixture is smooth. Batter should be runny enough to pour but stiff enough to keep it’s form in the hot pan and not run all over the pan. Batter may thicken while it sits waiting to be scooped. Add small amounts of water to thin it out a bit if needed. Use a 1/3 cup or 1/2 cup to scoop up batter and pour into hot pan. Flip pancake when bubbles start to appear on the uncooked side. This will be anywhere from 1-2 minutes. 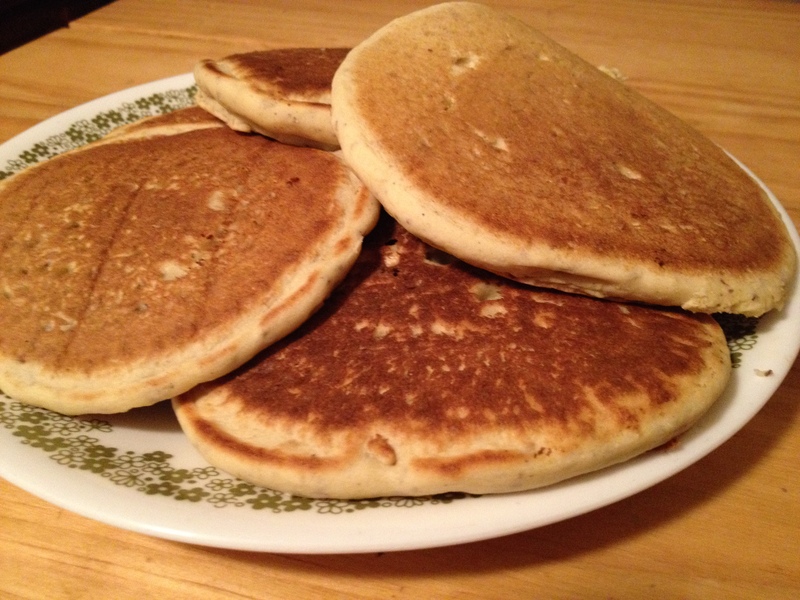 Pancakes should be medium brown on each side. Makes about 14 4″ cakes. This is perfect if your family does not eat a vegan or gluten free diet. I promise,they won’t be able to tell. They are best when eaten promptly. Gluten free pancakes do harden a bit when refrigerated. They are fine once warmed up but not as chewy and soft.